Looking to outdo our Dunkin' Donuts cookie dough coffee while ensuring Cookie Monster gets his caffeine fix, McDonald's France has added a trio of frappes bursting with actual cookie pieces. While each drink starts with vanilla frappe base, coffee, and ice, you can opt for a raspberry and white chocolate, double chocolate, or milk chocolate and hazelnut cookie that gets tossed into the blender. Well, most of it, anyway. According to Brand Eating, about 75% of the cookie goes into the drink, with the other 25% providing the massive garnish on top. (Because 4tbsp of whipped cream just wasn't enough.) 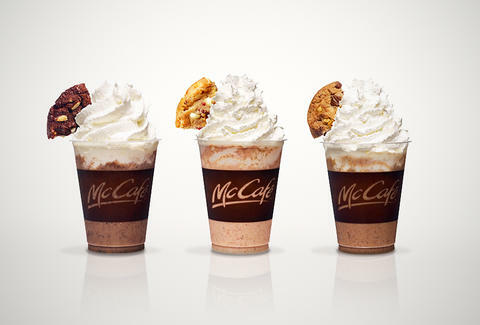 The drinks look pretty enviable, though if McCafe France was really serious, they'd make these with Thin Mints and Samoas. Kristin Hunt is a food/drink staff writer for Thrillist, and would drink coffee a lot more if it came with cookies every time. Follow her at @kristin_hunt.